The key is driving achievable yet meaningful success quickly so you and your team can sense the momentum then continue to expand your offerings. This guide outlines proven ways to build a profitable business that DOESN'T rely solely on traffic but focuses on delivering value through cultivating a highly targeted and engaged audience. In order to accomplish this, and frankly remain competitive, publishers must explore new and complementary ways of generating revenue that doesn't rely on the outdated and un-sustainable practices of traditional media companies or that tries to complete with the modern media giants like Google on a CPM (Cost per 1,000 impressions) basis. To that end, this guide focuses on ways that local-focused, community-centric publishers can make money online, even before they have any meaningful traffic. as well as recommendations that allow you to grow revenue as you grow your audience. In other words, how to grow your online presence in the most profitable way possible. While our Community Content Engine makes delivering value to advertisers and readers easier than ever, we recommend this approach to everyone and encourage people to begin adopting the strategies laid out here right away. The key to any successful online program is the ability to build a solid foundation of revenue which allows you to reinvest in your product as you continue to build your business. The easiest way to do this is with Community Sponsors. Community Sponsorships are a package designed specifically for early movers and those that want to be known for giving back to/supporting their community. It intentionally provides an incredible amount of value at a very reasonable price which makes it harder for advertisers to say no. It also allows you to generate a solid stream of recurring revenue that you can leverage to continue to build your digital presence. Regular promotion online - This could be sponsored content, featured events, Facebook shares, etc. Our recommended starting point for this package is $200 per month with a 6-12 month contract. The price is justified simply by including the page in-print recognizing them as a sponsor, but when combined with the directory listing ($25 value), a snapshot banner ad ($50+ value), recognition in your email newsletter ($100+ value), the logo in the footer of your site ($100+ value) and the online promotion/sponsored content ($100+ value), then it becomes an absolute no brainer for anyone who wishes to reach your audience. We’re starting to do some interesting things with our advertisers to help them reach more of their goals and connect with more locals online and right now we’re offering a plan that’s designed to recognize you as a local leader and help you reach an engaged audience. We’re looking for just 10 sponsors that want to support the community in a unique way and be associated with being a local leader. Is that you? Now, if you were starting a new publication, you wouldn't spend the time and money to produce the magazine until you had pre-sold some advertising. Your digital presence should be no different and Community Sponsors should be viewed as equivalent to your first handful of advertisers. Your goal should be to do whatever you need to do until you've "sold out" using the limited supply (8-12 spots) as a way of creating scarcity and getting potential advertisers to say "yes" quickly. When sold out, you should now have $1,600 to $2,400 in monthly recurring revenue that can be used to invest in the next phase of your digital growth. This will empower you to create more community resources and deliver even more value to your initial customers (this is the vision referenced above). Social promotions, or giveaways, are a great way to get paid to build your audience. When run the right way, promotions can help you build your email list and your Facebook followers while also making money through sponsorships. The idea is that each promotion (4 promotions per year) will have 5-10 sponsors who will pay you $100-200 cash ($1,000 per promotion in revenue) plus a $100 gift card that will be used as the prize. In return, you would handle running the promotion including design, setup, and promotion in order to deliver value to the sponsors (see below for more information on how). 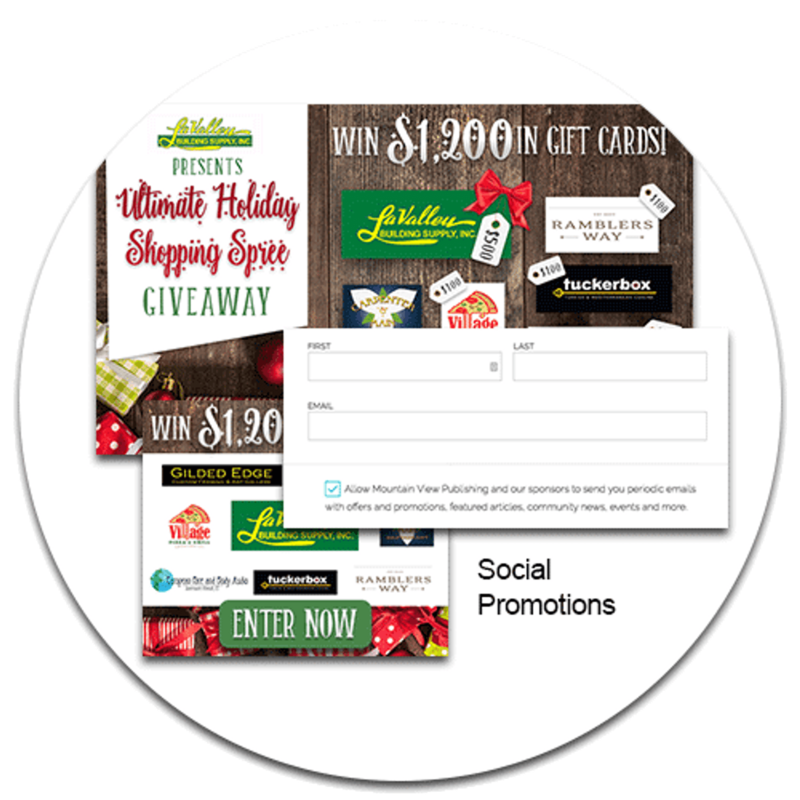 The value proposition for the sponsors is tied most closely to helping them build their email list. As long as your entry form for the contest has the appropriate disclaimers telling entrants that the list will be shared with sponsors and gives them the option to opt-out without affecting their chances of winning then you can safely do this. What is an email address worth to a sposnor? If every time the sponsor sends an email, 1% of recipients spend $50, then every 100 emails is worth $50 to them. If they send an email once per month for a year, then 100 emails is worth $600 to them ($50 x 12). Is that worth an investment of $100 to $200? The last point is particularly important, especially for sites with smaller audiences, as Facebook ads allow you to guarantee a good outcome. As little as $50 to $100 in Facebook advertising can drive 100's of entries and email opt-ins in addition to expanding your reach to new people. This both ensures you can report good results to sponsors but also helps you build your Facebook following and email list in the process. Social Promotions are so important to building your audience that we offer a service to those that don't want to deal with running social promotions themselves. Members of the Locable Publisher Network have the option of having our team run these contests for them for a very small fee. You can learn more about our Publisher Concierge Services here. As a local publisher, banner ads are probably the least interesting thing you can sell but they are still an integral part of the digital landscape. In order to help publishers standout from the competition, we've partnered with Broadstreet to deliver a unique ad sales experience to Members of the Locable Publisher Network. Normally, $200 or more per month, we're able to offer the Broadstreet at a reduced price through our partnership. The important thing to know about the Broadstreet Ad Server though is it gives you more than just basic banner ads; all of which help you stand out from the competition and many of which significantly outperform standard banner ads. You can create ads from Facebook posts, ads with countdowns, ads for real estate listings, and many, many more. One of our favorites to talk about is the Emcee Social Feed Ad which takes your advertisers most recent Facebook, Instagram, Twitter or even a text message and display's it as a feed of content on your site. Have you ever had an advertiser say they wish they'd reach more people on Facebook? Well, with the Emcee Social Feed ad you can help them reach more people from what they are already doing on social media! With 10-20 advertisers participating at $240 for the year, you can make a quick $2,400-$4,800. Not bad for the couple days it would take to sell it! While, publishers don't want to compete on CPM (Cost per 1,000 impression) against media giants like Google, a CPM calculation can be helpful in determining appropriate prices. Typical CPM's with Google Ads vary widely by industry but can range from pennies to $15 or more so using a $20 CPM would definitely represent a premium. However, as a local publisher you bring both a more targeted and engaged audience but also non-traditional ad types that can produce better results so a premium like this is justified. So as an example, if you have 10,000 monthly pageviews, you can use an adjusted CPM of $15-20 to calculate your initial pricing and would be looking at a price of $150-200 per month (10,000 / 1,000 = 10 x $15-20 = $150-200). A similar calculation can be done for newsletter sponsorship ads. As an example, if you have 2,000 subscribers, a 20% open rate, and use a $.50 per subscriber rate which is fairly typical, you would price your newsletter sponsorship ad at $200 per month (1,000 x 20% x $.50 = $200). Once you've filled these spots, you can expand revenue from banner ads by selling additional ads in each slot as traffic increases. This is called share of voice. For example, if you had 2 ads in the Pushdown slot, each ad would only show 50% of the time or have 50% share of voice. If it were 3 ads, it would show 1/3 of the time, and so on. We recommend up to 3 ads per slot. 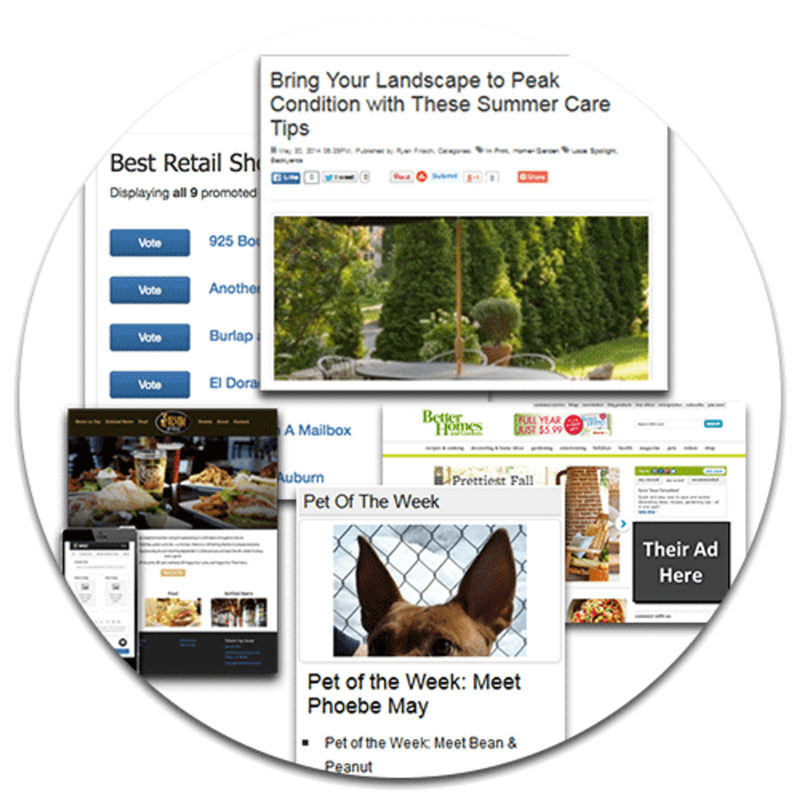 You can also introduce new ad slots especially in your email newsletter. 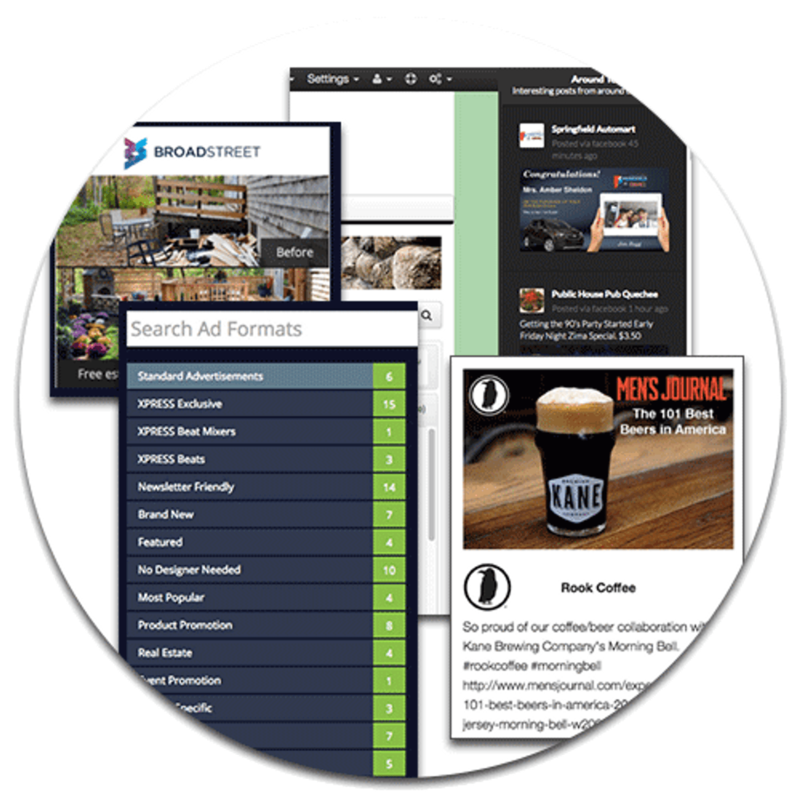 Broadstreet is fully integrated into the Community Content Engine and also includes technology to help prevent ad blockers from blocking your ads, great reporting, and more so you can deliver the best possible experience for your advertisers. Guides and Listings are closely related functions that provide a great opportunity to help local businesses get more recognition and rank better in Google. Guides, which are a simple way of organizing listings as a resource for the community, in particular are a great way to get started. Sponsorships provide the opportunity for advertisers to associate themselves with a given topic, i.e. a hotel sponsoring a Destination Guide. Activities Guide - Recommendations on things to do in your area like museums, parks and rec facilities, etc. Professional Services Guide - A list of local Lawyers, Financial Advisors, Health Professionals, etc. Destination Guide - A list of resources for tourists including hotels, landmarks, transportation, etc. We recommend that each sponsorship be $100/month and suggest creating 5 guides/sponsorships to start ($500 in monthly revenue) plus your Advertiser Guide for a total of 6 guides. On top of that, Premium Directory Listings provide a more passive sales opportunity that can be included as an add-on for print advertisers. For a recommended $25/month, Premium listings should allow business to showcase themselves on your site (in order to reach your audience). Unlike directories like Yelp, as a publisher, you are uniquely able to provide more context through articles and assuming you cross-link articles to directories many of your directory listings will end up ranking quite well in Google. Even just 40 existing advertisers spending an extra $25/month is an additional $1,000 a month in revenue. This should be offered to ALL existing print advertisers at least once! Regardless of where you start, the goal is to reach $500 in monthly recurring revenue from this channel while building a great local resource. When you put it all together, the resources here give you a blueprint to go from $0 to a solid digital foundation of $2,000 a month (Community Sponsorships) and from there to $40,000 in annual digital revenue by only selling out the items outlined above. Once you've reached this milestone, there is plenty more upside from simply doing what you are already doing. As traffic grows, you can sell more banner ads without diluting the value to existing advertisers (share of voice) and as you create more resources for the community (Guides in particular) more sponsorship opportunities become available. 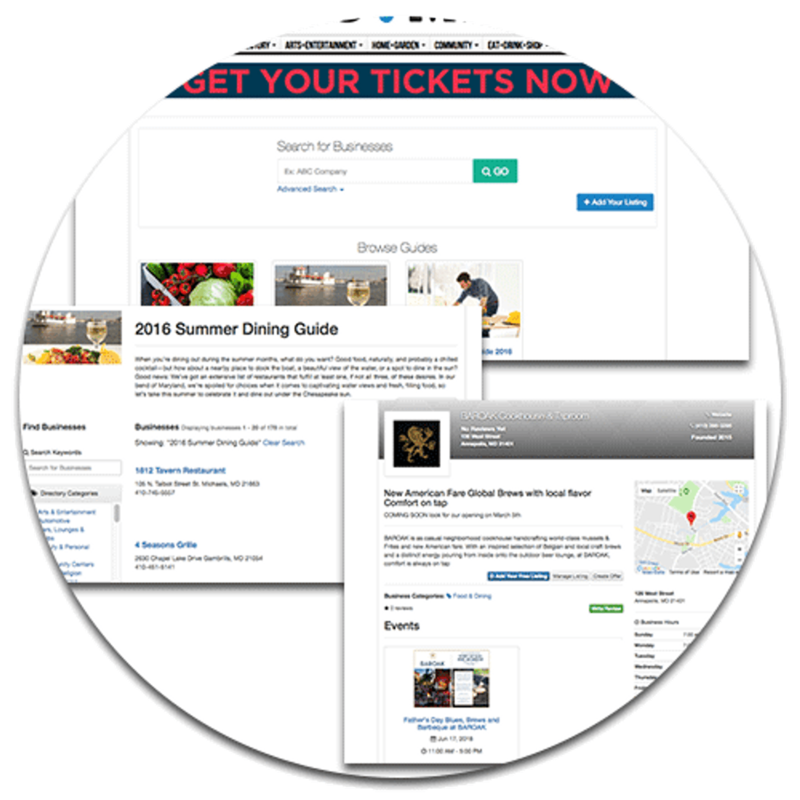 As you will see, you can build a profitable business by curating and packaging up great resources (directory listings & guides to go along with articles, events, and offers) for your community and the Community Content Engine can make managing all this as easy as possible for you. More importantly, you will be positioning yourself as the premium local brand and you will start to see people thanking you for doing what you do. Even better, you will find that business will start to look to you for marketing advice, which with all the noise out there this is important to protecting your market position within the community. When all is said and done, we want to put your brand at the center of your community and help you create stronger customer relationships.